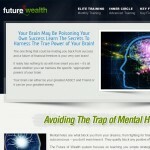 “Future Of Wealth”, and Future of Wealth 2.0, by Anik Singal, found at futureofwealth.com, is a so called personal development affiliate marketing membership program that is as highly questionable as its creator is. There is no end to the complaints I’ve found about Anik Singal and his previous scams, and it seems this time with Future Of Wealth he has gone for a new angle – portraying himself like some sort of low rent Deepak Chopra minus the true inspiration. The gobbledygook he spews out on Future Of Wealth about poisoned minds and other ramblings might sway the untrained newbies to buy into his expensive Future Of Wealth program but that’s all it is, pure nonsense. The Future Of Wealth course offers nothing new or good to help you succeed and his “spiritual guru”-like rambleings just annoy to no end. Nothing he says is backed up with facts or empirical data. In Future Of Wealth, Singal has offered contests, which no one ever wins, he has raised the minimum payout from $100 to $250, sells your personal data you gave them to third party clients, and lunges you with boiler room slicksters to upsell you to more expensive programs. The worst part is that Future Of Wealth with-holds commissions and tries to brainwash you into staying with the program, and still his “training” videos are filled with pure nonsense rambling about his life and other irrelevant things mixed in with hype that tells you nothing about what you are paying for. This guy has no remorse over what he does – and has done in his previous scams – to take peoples’ money in exchange for nothing useful in return, so I advise you not to fall for his gimmicks. Future Of Wealth is a scam of deplorable proportions, and how this man is still allowed to lure unsuspecting people in is anyone’s guess. Stay far away from this scam.